Recently, while I was browsing a website in Firefox, I found that it took forever to load the concerned web page. Blame it on my internet connection or on the condition of the web server hosting the web page, I was literally fed up with the wait and closed the window with disgust. It was during this time that I wondered whether it will make my browsing experience a bit more pleasant if I switched to a console web browser such as lynx. I am aware of a number of web browsers which have a very low memory foot print and also which discard plenty of fluff - which you find increasingly in websites being built now a days - while displaying web pages. Some of these web browsers being Dillo, Lynx and Links. Dillo is a web browser which require an X server to run. But the other two are console web browsers which display only text. 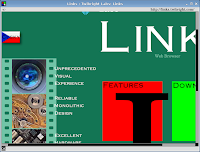 Links2 is a web browser which is based on 'links' and can be run in two modes. It will display web pages only in text when run in console mode and renders images in a variety of graphics formats such as PNG, Jpeg, Gif, Tiff and Xbm when run in graphics mode from within a X window system. You have to see it in action to actually fathom how it renders the web pages. I have included a couple of screenshots of web pages as viewed in links2 below. 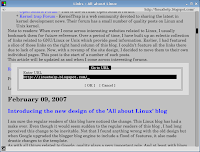 Fig: All about Linux blog rendered in links2. As you can see from the screenshots, websites which are built using tables are rendered properly where as those which use CSS lose their layout but are still equally readable. This is because links2 does not yet support CSS. '\' - toggle between viewing the web page and its source code. '/' - used to search for a word or term in the website that is displayed. [Esc] key - Shows a menu at the top of the browser from which you can also make choices. '=' - Provides further information about the web page such as its size, the web server serving the web page and its url. '|' - Pipe displays the header information. '<- ' - left arrow will take you to the previous view. '->' - right arrow will take you forward to the latest view. [Page up] and [Page down] - these keys can be used to navigate through the web page one page at a time. But you can also use [Space bar] and 'b' key combination for the same. 'g' - will pop-up a dialog box where you can enter the url of the website you want to view. To open this dialog box with the url of the current page already entered, press 'G'. Move the mouse pointer over an image and press 'i' to see only the image. ... which will save the contents of the news.google.com page into the 'news.txt' text file. Which means, using this method you can literally strip all the html elements and save only the text into file. There are a whole lot of command line switches available for links2 from those for changing the foreground and background of the webpage that is viewed to conducting a name lookup of a web address. Check the man page of links2 for more options. As with all things related to Linux and Unix, links2 web browser also stores all its configuration parameters in a text file. If you look into your home directory, you will find a hidden directory called .links2/ which contain all the files pertaining to the user's configuration. It is in the '.links2' directory that links2 web browser stores details such as your bookmarks, the browsing history and the per user configuration details. # This file is automatically generated by Links -- please do not edit. I found this web browser really sleek and easy to use. Considering that it renders graphic images without any problem when run in X windows, this could easily be a good replacement for the mainstream web browsers where one is concerned only in reading the content of a website without the usual distractions such as flash based websites and fancy CSS. Oh yeah, you can also say good bye to most ads you see cluttering websites these days when you use links2. I've been using links and elinks for what feels like an age on old machines. It's great to be able to surf well, even in text mode. I've an old 486-based laptop and links in graphical mode is terrific on this, where even Opera would struggle to perform. That sounds just like what I need. Many thanks! Links2 is a great "lean and mean" browser that does what I need without all the overhead. A web browser with the right balance between too much and too little. I 'm not needing eye candy and animations for alot of what I do on the web. I haven't used links2, but I feel the need for "just the facts" on some web pages. Slashdot, for instance, was dog-slow at some locations, and I noticed that it was loading a lot of things from images.slashdot.org. I Adblocked all images from that location and *pow*! It loads a LOT faster now. Almost instantaneous. There's something to be said for lean and mean. Does this enable flash? If so, are there any other stream stuff that can be plugged?